Similar to other friends and colleagues around the world, I was shocked when I received a message from Millie’s long-time former administrative assistant, Laura, informing me that Millie died on February 20, 2017. Only a few days before, on January 29, Millie and I had exchanged emails about some recent work I did, about which I wanted to hear Millie’s opinion. As always, I had received a prompt and very useful (and thoughtful) reply from Millie. I couldn’t imagine she was just gone! When Millie’s daughter, Marianne, asked me to write down a few of my memories of Millie, many episodes came to mind. 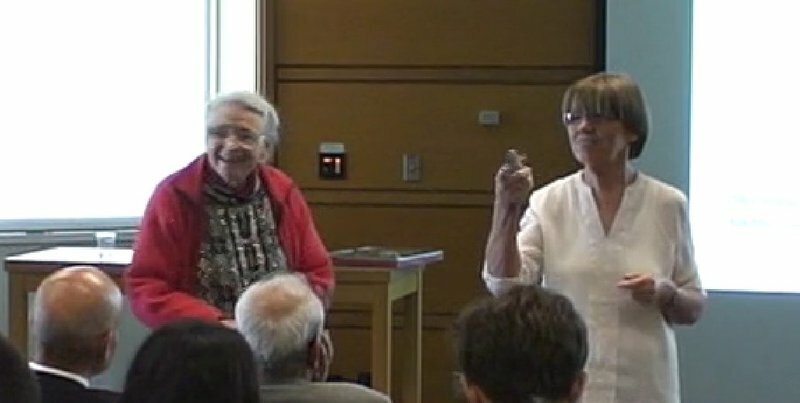 I have so many memories of Millie, spanning from the spring of 1993 — when I saw Millie for the first time in an elevator at MIT — to November 10 2015, when we met in person for the last time, one day before Millie’s 85th birthday . I came to MIT in February, 1993, from the former German Democratic Republic. I had a German Heisenberg Fellowship, which gave me the opportunity to go to MIT with “my own money,” allowing me to choose where I wanted to work. Light and optical spectroscopy were my absolute favorite fields, and the scientific environment and experimental conditions in the Spectroscopy Laboratory were almost perfect for my scientific plans. So I went to the MIT Spectroscopy Lab. This unit was located at the MIT campus — just a few hallways and a few floors away from Millie’s office. I often used an elevator to get there, and soon found I was often riding the elevator with an older lady who was always carrying a lot of stuff on a little trolley — very odd stuff! A projector, slides, models of molecules and buckyballs, and so on! Clearly, these props were to help her teach a class. 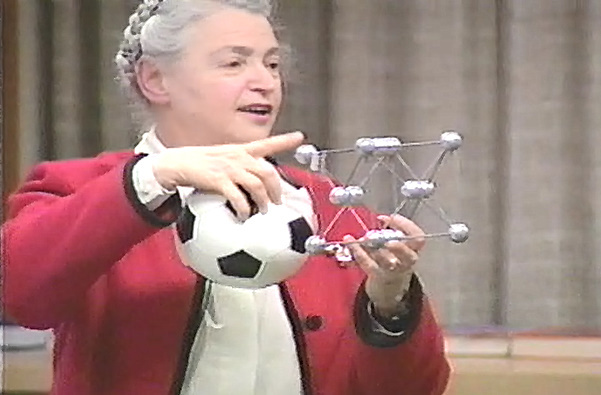 Millie giving a lecture in the 1990's, with props. I must admit, I was a little bit curious about this lady, and wanted to speak to her… but I was uncomfortable speaking English at the time, and felt I was too “new” to the United States to start a conversation with a stranger in an elevator. I tried to content myself with just helping her move the trolley, and we would exchange friendly smiles. I remember thinking she had a very nice smile. I still did not know who she was. I regret to say that even the name Millie Dresselhaus was not instantly recognizable to me, back then, since I was not really familiar with carbon research at that time. Little did I know, these chance meetings in an MIT elevator were just the start of a beautiful friendship. 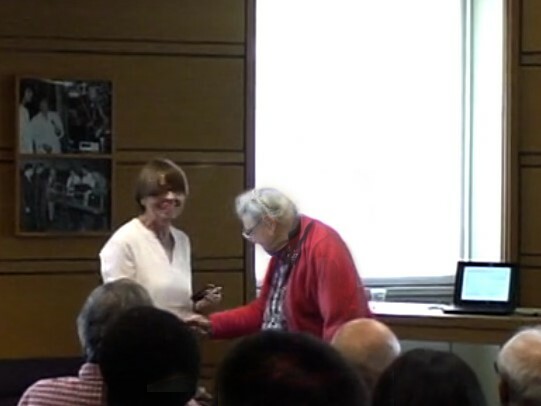 Two or three years later, at the Modern Optics and Spectroscopy Seminar (MOS seminar), organized by the Spectroscopy Lab, I was surprised to discover that the lady from the elevator was one of the speakers! She presented a talk about a fascinating new structure called a single wall carbon nanotubes. I was impressed by the talk; Millie was a very talented speaker. Her talks were clearly structured and precise, and she explained her ideas in a clear and instructive way. 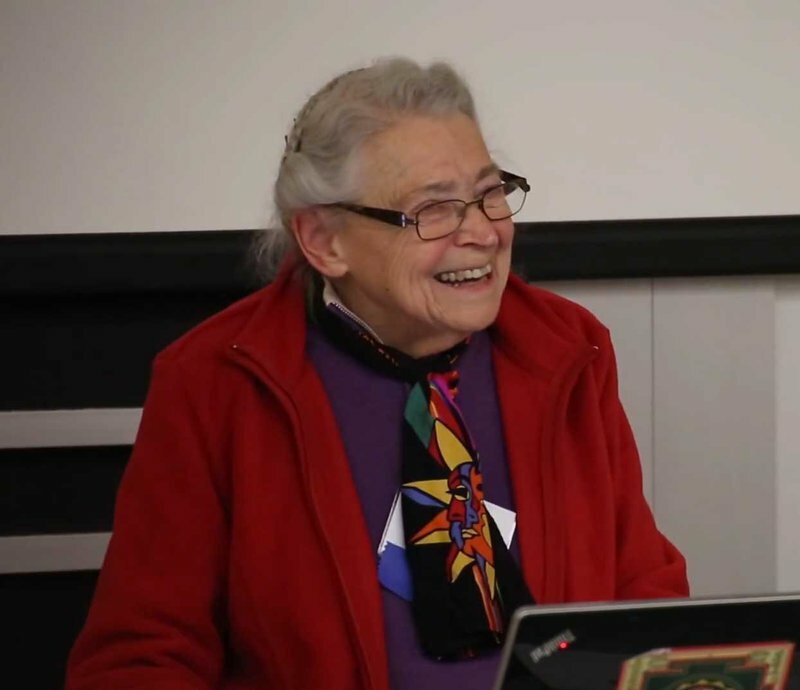 I remember watching her demonstrate how you could roll a single layer of graphene (which was just a concept, back then) into a hollow tube, thus creating a versatile carbon structure with a diameter of a few nanometers, which exhibited sharp electronic levels and many other exciting properties. For me, probably mostly impressive thing about the talk was Millie’s enthusiasm for science she was explaining, and the way she used that to enrapture to the audience. Her excitement was infectious! I could see why Millie was such an impressive keynote speaker. 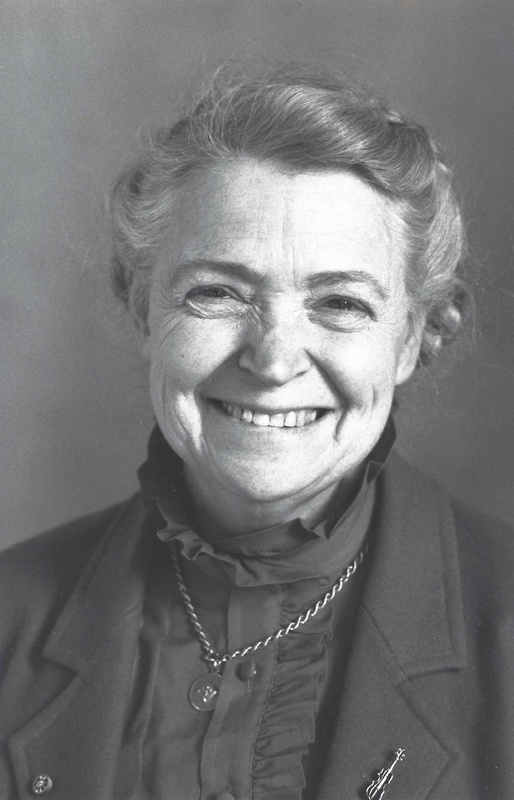 Millie was known as a dynamic lecturer. As I later found out, Millie has a reputation for her keynote speeches. At conferences around the world, lecture halls would always be filled to bursting whenever Millie was scheduled to speak. People would stand in the back or along the sides of the room, just to get the chance to hear Millie. And the quality of her talks and speeches did not change, over the years. When she presented the annual Dasari lecture at MIT, her talk was just as brilliant and enthusiastic as the first MOS talk I heard. People came away from the lecture both excited and impressed by Millie’s scientific charm. They could not believe that this lady was only one day away from her 85th birthday! But let’s return to the 1990’s, and the first time I heard Millie speak. After Millie’s talk at the MOS seminar about single wall carbon nanotubes, I have to admit that I was inspired. I began applying the spectroscopic methods I was working on to “Millie’s” carbon structures, and realized that I could get interesting results if I used an enhanced local field of silver nanoparticles to study the Raman spectra of single wall carbon nanotubes. I told this to Millie, and was not disappointed. Millie was very excited about my idea of applying a new spectroscopic method to these nanostructures, and in the matter of only a few days, we began a collaborative work together at the Spectroscopy Lab. Our work was strongly supported by the Director of the Spec. Lab, Michael S. Feld, and the Associate Director, Ramachandra R. Dasari. What I soon learned was that this was typical of Millie; if she was convinced that a project was promising, she didn’t waste any time — but began work immediately! What was it like working with Millie? Unique. 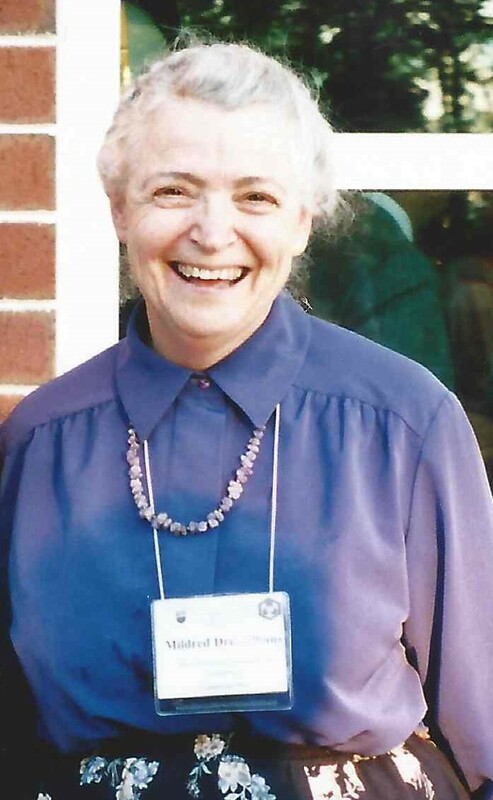 Although she was a distinguished Institute Professor, who had many other commitments to both science and society, Millie’s office door was always open, and she always made herself available to have scientific discussions with students and co-workers. Back then, I used to come into work at the Lab very early in the morning. Millie was also an “early bird,” and we often had interesting and insightful discussions in her office at 6:30 AM. When I returned to Berlin, when I was appointed to the Technical University, I continued to remain in close contact with Millie, and continued my collaborative projects with MIT. Mainly thanks to Millie’s initiative and support, I returned to MIT as Rockefeller Mauze Visiting Professor in 2000/2001, and wound up teaching an EECS course on single molecule spectroscopy. At that time, single molecule spectroscopy was a relatively new field, and I was privileged to teach one of the first regular classes on plasmonic approaches in optical spectroscopy. During our many years of collaborative work, I learned a lot from Millie. Although we began by bonding over science, we soon developed a friendship that went beyond the lab, and which involved both our families. My husband, Harald, and our daughter both remember the wonderful and cozy thanksgiving celebrations at Millie and Gene’s house, where we joined her family and other students to give thanks for what we had and to eat lots of turkey. Millie and Gene were such kind and lovely hosts, and the turkey they cooked was delicious. 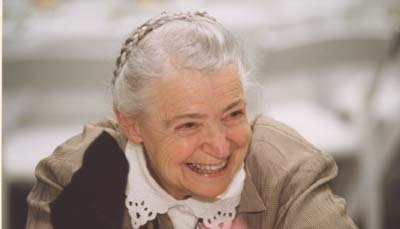 After dinner, Millie often took the chance to help her students prepare for the upcoming MRS meeting, which almost always took place in Boston, the week after Thanksgiving. Often, when Millie came to Europe for a visit, she would take the opportunity to stop over and visit us in Berlin. The days when Millie came to visit were always very busy. Knowing Millie liked to keep busy while she traveled, we tried to stuff as much science as we could into the short 24 hours of the day! I recall wonderful and productive days packed with interesting discussions, meetings, and — in between — sightseeing tours. Millie seemed to get never tired. During one of her visits, we began working at home early in the morning. The plan was to go for lunch, and then go to Millie’s scheduled talk an the Technical University. Millie, however, decided not to bother going out for lunch, but helped us cobble together a meal from our fridge, so we could continue to work on our project into the late afternoon! We arrived at the Technical University just in time for her talk. Afterwards, we went out to dinner in the city of Berlin, and then — as per Millie’s special request — late at night, we wound up on the TV-tower. During that visit, while we were doing all that hard work, Millie was waiting for an important communication from home; I remember how happy she was when a fax arrived from Gene at our house, which reported the good and safe arrival of her granddaughter, Clara. Millie was always very devoted to her family. She and I shared the opinion that it’s possible — and enjoyable — to both work as a woman in science and raise a family filled with children. Choosing the right partner was important, of course — but the two goals did not have to be in conflict with each other. Millie shakes my hand at the Dasari Lecture, 2014. I remember, with great fondness, Millie’s visit to Europe in the late summer of 2014. At that time, I was professor at the Danish Technical University. Millie took the opportunity to visit us in Copenhagen on her return trip from Norway. 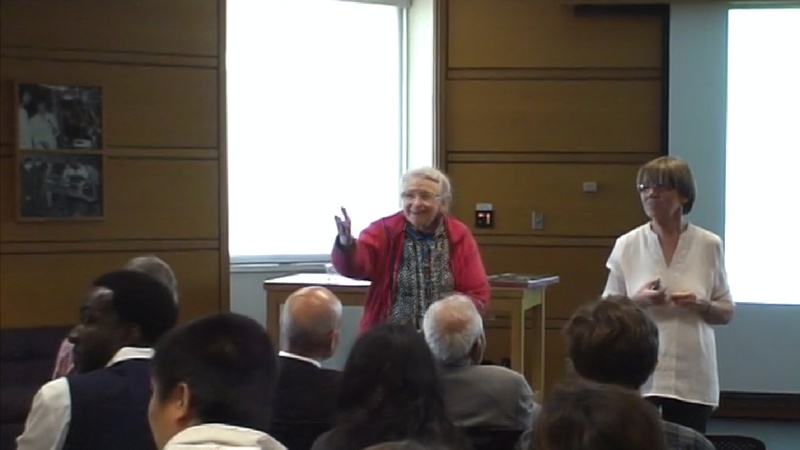 See, after winning the Kavli Prize for Nanoscience in 2012, Millie was invited to be on the Kavli Prize Committee, and in 2014, on behalf of the committee, she was invited to meet that years’ prize recipients and listen to their talks. She was traveling with her daughter, Marianne. I picked up Millie and her daughter at the airport, very early in the morning. I imagine she’d boarded the plane before 5:00 am! I had arranged breakfast together with my students, and she was thrilled to come along and meet them. They were also thrilled. They had been talking all week about how exciting it was to meet such a famous scientist — and one who (they had heard) was also so nice and approachable. They hung on Millie’s every word, at dinner. Millie was a real role model for them all — particularly for the young women in the group, who found her story inspirational. That evening, Millie, Marianne, Harald (my husband), and I were seated at a little restaurant in the Oeresund, drinking lots of tea and chatting about science and interesting happenings around the world. I remember thinking to myself… This is the perfect moment. I must keep this moment with me for the rest of my life. 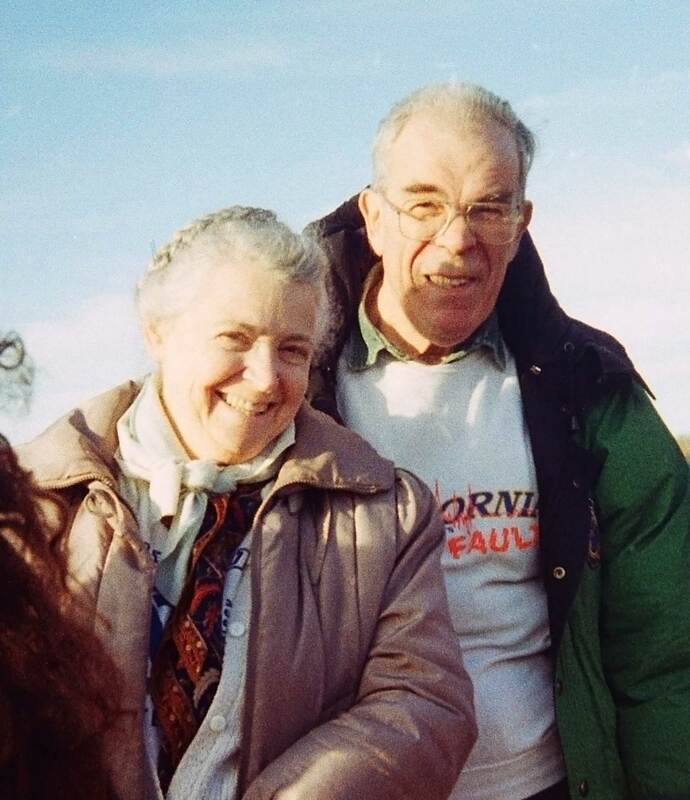 Millie was not only an exceptional scientist — she was also one of the most kindhearted and wonderful people I have ever met, one who gave so much intellectual inspiration and love to anyone who had the pleasure to meet her. I am grateful for the many fond memories I have of Millie, and I am grateful that I’ve learned so much from her. The times we shared are cherished memories that I will forever hold in my heart.